Article by By Anita Fuzi, Lidia Gryszkiewicz, & Dariusz Sikora: “Over the years, many social sector leaders have written about the difficulties of measuring social impact. Over the past few decades, they’ve called for more skilled analysts, the embedding of impact measurement in the broader investment process, and the development of impact measurement roadmaps. Yet measurement remains a constant challenge for the sector. For once, let’s take a step back instead of looking further forward. Impact assessments are important tools for learning about effective solutions to social challenges, but do they really make sense when an organization is not fully leveraging its potential to address those challenges and deliver positive impact in the first place? Should well-done impact assessment remain the holy grail, or should we focus on organizations’ ability to deliver impact? We believe that before diving into measurement, organizations must establish awareness of and readiness for impact in every aspect of their operations. In other words, they need to assess their social impact capability system before they can even attempt to measure any impact they have generated. We call this the “capability approach to social impact,” and it rests on an evaluation of seven different organizational areas…. When organizations do not have the right support system and resources in place to create positive social impact, it is unlikely that actual attempts at impact assessment will succeed. For example, measuring an organization’s impact on the local community will not bear much fruit if the organization’s strategy, mission, vision, processes, resources, and values are not designed to support local community involvement in the first place. It is better to focus on assessing impact readiness level—whether an organization is capable of delivering the impact it wishes to deliver—rather than jumping into the impact assessment itself.Examining these seven capability areas can help organizations determine their readiness for creating impact. 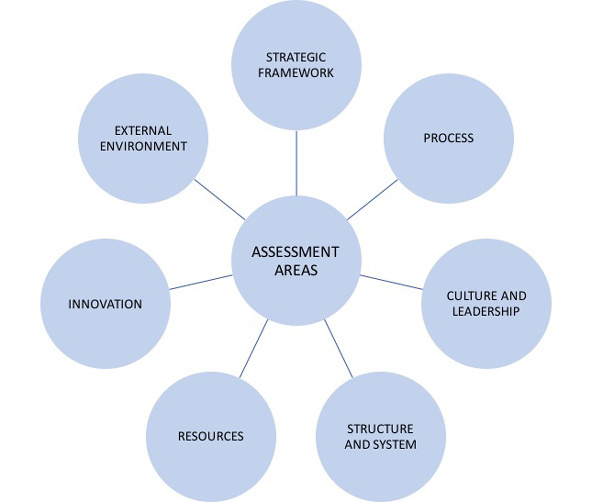 To help assess this, we created a diagnostic tool— based on extensive literature review and our advisory experience—that evaluates seven capability areas: strategic framework, process, culture and leadership, structure and system, resources, innovation, and the external environment. Organizations rate each area on a scale from one to five, with one being very low/not important and five being very high/essential. Ideally, representatives from all departments complete the assessment collectively to ensure that everyone is on the same page….(More)”. Anni Rowland-Campbell at NPC: “In his book The Code Economy Philip E. Auerswald talks about the long history of humans developing codeas a mechanism by which to create and regulate activities and markets. We have Codes of Practice, Ethical Codes, Building Codes, and Legal Codes, just to name a few. Each and every one of these is based on the data of human behaviour, and that data can now be collected, analysed, harvested and repurposed as never before through the application of intelligent machines that operate and are instructed by algorithms. Anything that can be articulated as an algorithm—a self-contained sequence of actions to be performed—is now fertile ground for machine analysis, and increasingly machine activity. So, what does this mean for us humans who, are ourselves a conglomeration of DNA code? I have spent many years thinking about this. Not that long ago my friends and family tolerated my speculations with good humour, but a fair degree of scepticism. Now I run workshops for boards and even my children are listening far more intently. Because people are sensing that the invasion of the ‘Social Machine’ is changing our relationship with such things as privacy, as well as with both ourselves and each other. It is changing how we understand our role as humans. The Social Machine is the name given to the systems we have created that blur the lines between computational processes and human input, of which the World Wide Web is the largest and best known example. These ‘smart machines’ are increasingly pervading almost every aspect of human existenceand, in many ways, getting to know us better than we know ourselves. Consider the Luddites as they smashed the looms in the early 1800s. Their struggle is instructive because they were amongst the first to experience technological displacement. They sensed the degradation of human kind and they fought for social equality and fairness in the distribution of the benefits of science and technology to all. If knowledge is power, philanthropy must arm itself with knowledge of digital to ensure the power of digital lies with the many and not the few. The best place to start in understanding the digital world as it stands now is to begin to see the world, and all human activities, through the lens of data and as a form of digital currency. This links back to the earlier idea of codes. Our activities, up until recently, were tacit and experiential, but now they are becoming increasingly explicit and quantified. Where we go, who we meet, what we say, what we do is all being registered, monitored and measured as long as we are connected to the digital infrastructure. A new currency is emerging that is based on the world’s most valuable resource: data. It is this currency that connects the arteries and capillaries, and reaches across all disciplines and fields of expertise. The kind of education that is required now is to be able to make connections and to see the opportunities in the interstice between policy and day-to-day reality. The dominant players in this space thus far have been the large corporations and governments that have harnessed and exploited digital currencies for their own benefit. Shoshana Zuboff describes this as the ‘surveillance economy’. But this data actually belongs to each and every human who generates it. As people begin to wake up to this we are gradually realising that this is what fuels the social currency of entrepreneurship, leadership and innovation, and provides the legitimacy upon which trust is based. Trust is an outcome of experiences and interactions, but governments and corporations have transactionalised their interactions with citizens and consumer through exploiting data. As a consequence they have eroded the esteem with which they are held. The more they try to garner greater insights through data and surveillance, the more they alienate the people they seek to reach. Introduction to the Special Issue of the Philosophical Transactions of the Royal Society by Sandra Wachter, Brent Mittelstadt, Luciano Floridi and Corinne Cath: “Artificial intelligence (AI) increasingly permeates every aspect of our society, from the critical, like urban infrastructure, law enforcement, banking, healthcare and humanitarian aid, to the mundane like dating. AI, including embodied AI in robotics and techniques like machine learning, can improve economic, social welfare and the exercise of human rights. Owing to the proliferation of AI in high-risk areas, the pressure is mounting to design and govern AI to be accountable, fair and transparent. How can this be achieved and through which frameworks? This is one of the central questions addressed in this special issue, in which eight authors present in-depth analyses of the ethical, legal-regulatory and technical challenges posed by developing governance regimes for AI systems. It also gives a brief overview of recent developments in AI governance, how much of the agenda for defining AI regulation, ethical frameworks and technical approaches is set, as well as providing some concrete suggestions to further the debate on AI governance…(More)”. Whither large International Non-Governmental Organisations? Working Paper by Penny Lawrence: “Large international non-government organisations (INGOs) seem to be in an existential crisis in their role in the fight for social justice. Many, such as Save the Children or Oxfam, have become big well-known brands with compliance expectations similar to big businesses. Yet the public still imagine them to be run by volunteers. Their context is changing so fast, and so unpredictably, that they are struggling to keep up. It is a time of extraordinary disruptive change including the digital transformation, changing societal norms and engagement expectations and political upheaval and challenge. Fifteen years ago the political centre-ground in the UK seemed firm, with expanding space for civil society organisations to operate. Space for civil society voice now seems more threatened and challenged (Kenny 2015). It’s a tough context to be leading an INGO through, but INGOs have appeared ill prepared and slow to respond to the threats and opportunities, not realising how much they may need to change to respond to the fast evolving context and expectations. Large INGOs spend most of their energy exploiting present grant and contract business models, rather than exploring the opportunities to overcome poverty offered by such disruptive change. Their size and structures do not enable agility. They are too internally focused and self-referencing at a time when the world around them is changing so fast, and when political sands have shifted. Focussing on the internationalisation of structures and decision-making means large INGOs are ‘defeated by our own complexity’, as one INGO interviewee put it. The purpose of this paper is to stimulate thinking amongst large INGOs at a time of such extraordinary disruptive change. The paper explores options for large INGOs, in terms of function and structure. After outlining large INGOs’ history, changing context, value and current thinking, it explores learning from others outside the development sector before suggesting the emerging options. It reflects on what’s encouraging and what’s stopping change and offers possible choices and pathways forwards….(More)”. Paulse and Abrahams are just two of thousands of beneficiaries of the Poverty Stoplight, a self-evaluation tool that’s now redefining poverty in countries as diverse as Argentina and the U.K.; Mexico and Tanzania; Chile and Papua New Guinea. By getting families to rank their own economic condition red, yellow or green based upon 50 indicators, the Poverty Stoplight gives families the agency to pull themselves out of poverty and offers organizations insight into whether their programs are working. Social entrepreneur Martín Burt, who founded Fundación Paraguaya 33 years ago to promote entrepreneurship and economic empowerment in Paraguay, developed the first, paper-based prototype of the Poverty Stoplight in 2010 to help the organization’s microfinance clients escape the poverty cycle….Because poverty is multidimensional, “you can have a family with a proper toilet but no savings,” points out Burt. Determining questionnaires span six different aspects of people’s lives, including softer indicators such as community involvement, self-confidence and family violence. The survey, a series of 50 multiple-choice questions with visual cues, is aimed at households, not individuals, because “you cannot get a 10-year-old girl out of poverty in isolation,” says Burt. Confidentiality is another critical component….(More)”. Skot Thayer and Alex Hern at the Guardian: “Rohingya refugees are turning to blockchain-type technology to help address one of their most existential threats: lack of officially-recognised identity. Denied citizenship in their home country of Myanmar for decades, the Muslim minority was the target of a brutal campaign of violence by the military which culminated a year ago this week. A “clearance operation” led by Buddhist militia sent more than 700,000 Rohingya pouring over the border into Bangladesh, without passports or official ID. The Myanmar government has since agreed to take the Rohingya back, but are refusing to grant them citizenship. Many Rohingya do not want to return and face life without a home or an identity. This growing crisis prompted Muhammad Noor and his team at the Rohingya Project to try to find a digital solution. Using blockchain-based technology, Noor, is trialling the use of digital identity cards that aim to help Rohingya in Malaysia, Bangladesh and Saudi Arabia access services such as banking and education. The hope is that successful trials might lead to a system that can help the community across southeast Asia. Under the scheme, a blockchain database is used to record individual digital IDs, which can then be issued to people once they have taken a test to verify that they are genuine Rohingya…. Blockchain-based initiatives, such as the Rohingya Project, could eventually allow people to build the network of relationships necessary to participate in the modern global economy and prevent second and third generation “invisible” people from slipping into poverty. It could also allow refugees to send money across borders, bypassing high transaction fees. In Jordan’s Azraq refugee camp, the United Nations World Food Programme (WFP) is using blockchain and biometrics to help Syrian refugees to purchase groceries using a voucher system. This use of the technology allows the WFP to bypass bank fees. But Al Rjula says privacy is still an issue. “The technology is maturing, yet implementation by startups and emerging tech companies is still lacking,” he says. The involvement of a trendy technology such as blockchains can often be enough to secure the funding, attention and support that start-ups – whether for-profit or charitable – need to thrive. But companies such as Tykn still have to tackle plenty of the same issues as their old-fashioned database-using counterparts, from convincing governments and NGOs to use their services in the first place to working out how to make enough overhead to pay staff, while also dealing with the fickle issues of building on a cutting-edge platform. Blockchain-based humanitarian initiatives will also need to reckon with the problem of accountability in their efforts to aid refugees and those trapped in the limbo of statelessness. Dilek Genc, a PhD candidate at the University of Edinburgh who studies blockchain-type applications in humanitarian aid and development, saysif the aid community continues to push innovation using Silicon Valley’s creed of “fail fast and often,” and experiment on vulnerable peoples they will be fundamentally at odds with humanitarian principles and fail to address the political roots of issues facing refugees…(More)”. Joshua Blumenstock at Nature: “Today, 95% of the global population has mobile-phone coverage, and the number of people who own a phone is rising fast (see ‘Dialling up’)1. Phones generate troves of personal data on billions of people, including those who live on a few dollars a day. So aid organizations, researchers and private companies are looking at ways in which this ‘data revolution’ could transform international development. Some businesses are starting to make their data and tools available to those trying to solve humanitarian problems. The Earth-imaging company Planet in San Francisco, California, for example, makes its high-resolution satellite pictures freely available after natural disasters so that researchers and aid organizations can coordinate relief efforts. Meanwhile, organizations such as the World Bank and the United Nations are recruiting teams of data scientists to apply their skills in statistics and machine learning to challenges in international development. But in the rush to find technological solutions to complex global problems there’s a danger of researchers and others being distracted by the technology and losing track of the key hardships and constraints that are unique to each local context. Designing data-enabled applications that work in the real world will require a slower approach that pays much more attention to the people behind the numbers…(More)”. David C.W. Parker at The Forum: “Nearly 40 years ago, Richard Fenno published Home Style, a seminal volume explaining how members of Congress think about and engage in the process of representation. To accomplish his task, he observed members of Congress as they crafted and communicated their representational styles to the folks back home in their districts. The book, and Fenno’s ensuing research agenda, served as a clarion call to move beyond sophisticated quantitative analyses of roll call voting and elite interviews in Washington, D.C. to comprehend congressional representation. Instead, Fenno argued, political scientists are better served by going home with members of Congress where “their perceptions of their constituencies are shaped, sharpened, or altered” (Fenno 1978, p. xiii). These perceptions of constituencies fundamentally shape what members of Congress do at home and in Washington. If members of Congress are single-minded seekers of reelection, as we often assume, then political scientists must begin with the constituent relationship essential to winning reelection. Go home, Fenno says, to understand Congress. There are many ways constituency relationships can be understood and uncovered; the preferred method for Fenno is participant observation, which he variously terms as “soaking and poking” or “just hanging around.” Although it sounds easy enough to sit and watch, good participant observation requires many considerations (as Fenno details in a thorough appendix to Home Style). In this appendix, and in another series of essays, Fenno grapples forthrightly with the tough choices researchers must consider when watching and learning from politicians. In this essay, I respond to Fenno’s thought-provoking methodological treatise in Home Style and the ensuing collection of musings he published as Watching Politicians: Essays on Participant Observation. I do so for three reasons: First, I wish to reinforce Fenno’s call to action. As the study of political science has matured, it has moved away from engaging with politicians in the field across the various sub-fields, favoring statistical analyses. “Everyone cites Fenno, but no one does Fenno,” I recently opined, echoing another scholar commenting on Fenno’s work (Fenno 2013, p. 2; Parker 2015, p. 246). Unfortunately, that sentiment is supported by data (Grimmer 2013, pp. 13–19; Curry 2017). Although quantitative and formal analyses have led to important insights into the study of political behavior and institutions, politics is as important to our discipline as science. And in politics, the motives and concerns of people are important to witness, not just because they add complexity and richness to our stories, but because they aid in theory generation.1 Fenno’s study was exploratory, but is full of key theoretical insights relevant to explaining how members of Congress understand their constituencies and the ensuing political choices they make. Second, to “do” participant observation requires understanding the choices the methodology imposes. This necessitates that those who practice this method of discovery document and share their experiences (Lin 2000). The more the prospective participant observer can understand the size of the choice set she faces and the potential consequences at each decision point in advance, the better her odds of avoiding unanticipated consequences with both immediate and long-term research ramifications. I hope that adding my cumulative experiences to this ongoing methodological conversation will assist in minimizing both unexpected and undesirable consequences for those who follow into the field. Fenno is open about his own choices, and the difficult decisions he faced as a participant observer. Encouraging scholars to engage in participant observation is only half the battle. The other half is to encourage interested scholars to think about those same choices and methodological considerations, while acknowledging that context precludes a one-size fits all approach. Fenno’s choices may not be your choices – and that might be just fine depending upon your circumstances. Fenno would wholeheartedly agree. Finally, Congress and American politics have changed considerably from when Fenno embarked on his research in Home Style. At the end of his introduction, Fenno writes that “this book is about the early to mid-1970s only. These years were characterized by the steady decline of strong national party attachments and strong local party organizations. … Had these conditions been different, House members might have behaved differently in their constituencies” (xv). Developments since Fenno put down his pen include political parties polarizing to an almost unprecedented degree, partisan attachments strengthening among voters, and technology emerging to change fundamentally how politicians engage with constituents. In light of this evolution of political culture in Washington and at home, it is worth considering the consequences for the participant-observation research approach. Many have asked me if it is still possible to do such work in the current political environment, and if so, what are the challenges facing political scientists going into the field? This essay provides some answers. I proceed as follows: First, I briefly discuss my own foray into the world of participant observation, which occurred during the 2012 Senate race in Montana. Second, I consider two important methodological considerations raised by Fenno: access and participation as an observer. Third, I relate these two issues to a final consideration: the development of social media and the consequences of this for the participant observation enterprise. Finally, I show the perils of social science divorced from context, as demonstrated by the recent Stanford-Dartmouth mailer scandal. I conclude with not just a plea for us to pick up where Fenno has left off, but by suggesting that more thinking like a participant observer would benefit the discipline as whole by reminding us of our ethical obligations as researchers to each other, and to the political community that we study…(More)”. Article by Anthony McCosker and Timothy Graham in MC Journal: “There are many examples globally of the use of social media to engage publics in battles over urban development or similar issues (e.g. Fredericks and Foth). Some have asked how social media might be better used by neighborhood organisations to mobilise protest and save historic buildings, cultural landmarks or urban sites (Johnson and Halegoua). And we can only note here the wealth of research literature on social movements, protest and social media. To emphasise Gerbaudo’s point, drawing on Mattoni, we “need to account for how exactly the use of these media reshapes the ‘repertoire of communication’ of contemporary movements and affects the experience of participants” (2). For us, this also means better understanding the role that social data plays in both aiding and reshaping urban protest or arming third sector groups with evidence useful in social institutions such as the courts. New modes of digital engagement enable forms of distributed digital citizenship, which Meikle sees as the creative political relationships that form through exercising rights and responsibilities. Associated with these practices is the transition from sanctioned, simple discursive forms of social protest in petitions, to new indicators of social engagement in more nuanced social media data and the more interactive forms of online petition platforms like change.org or GetUp (Halpin et al.). These technical forms code publics in specific ways that have implications for contemporary protest action. That is, they provide the operational systems and instructions that shape social actions and relationships for protest purposes (McCosker and Milne). All protest and social movements are underwritten by explicit or implicit concepts of participatory publics as these are shaped, enhanced, or threatened by communication technologies. But participatory protest publics are uneven, and as Kelty asks: “What about all the people who are neither protesters nor Twitter users? In the broadest possible sense this ‘General Public’ cannot be said to exist as an actual entity, but only as a kind of virtual entity” (27). Kelty is pointing to the porous boundary between a general public and an organised public, or formal enterprise, as a reminder that we cannot take for granted representations of a public, or the public as a given, in relation to Like or follower data for instance. If carefully gauged, the concept of data publics can be useful. To start with, the notions of publics and publicness are notoriously slippery. Baym and boyd explore the differences between these two terms, and the way social media reconfigures what “public” is. Does a Comment or a Like on a Facebook Page connect an individual sufficiently to an issues-public? As far back as the 1930s, John Dewey was seeking a pragmatic approach to similar questions regarding human association and the pluralistic space of “the public”. For Dewey, “the machine age has so enormously expanded, multiplied, intensified and complicated the scope of the indirect consequences [of human association] that the resultant public cannot identify itself” (157). To what extent, then, can we use data to constitute a public in relation to social protest in the age of data analytics? There are numerous well formulated approaches to studying publics in relation to social media and social networks. Social network analysis (SNA) determines publics, or communities, through links, ties and clustering, by measuring and mapping those connections and to an extent assuming that they constitute some form of sociality. Networked publics (Ito, 6) are understood as an outcome of social media platforms and practices in the use of new digital media authoring and distribution tools or platforms and the particular actions, relationships or modes of communication they afford, to use James Gibson’s sense of that term. “Publics can be reactors, (re)makers and (re)distributors, engaging in shared culture and knowledge through discourse and social exchange as well as through acts of media reception” (Ito 6). Hashtags, for example, facilitate connectivity and visibility and aid in the formation and “coordination of ad hoc issue publics” (Bruns and Burgess 3). Gray et al., following Ruppert, argue that “data publics are constituted by dynamic, heterogeneous arrangements of actors mobilised around data infrastructures, sometimes figuring as part of them, sometimes emerging as their effect”. The individuals of data publics are neither subjugated by the logics and metrics of digital platforms and data structures, nor simply sovereign agents empowered by the expressive potential of aggregated data (Gray et al.). Data publics are more than just aggregates of individual data points or connections. They are inherently unstable, dynamic (despite static analysis and visualisations), or vibrant, and ephemeral. We emphasise three key elements of active data publics. First, to be more than an aggregate of individual items, a data public needs to be consequential (in Dewey’s sense of issues or problem-oriented). Second, sufficient connection is visible over time. Third, affective or emotional activity is apparent in relation to events that lend coherence to the public and its prevailing sentiment. To these, we add critical attention to the affordising processes – or the deliberate and incidental effects of datafication and analysis, in the capacities for data collection and processing in order to produce particular analytical outcomes, and the data literacies these require. We return to the latter after elaborating on the Save the Palace case….(More)”. Nick Wallace at the Center for Data Innovation: “French President Emmanuel Macron recently endorsed a national AI strategy that includes plans for the French state to make public and private sector datasets available for reuse by others in applications of artificial intelligence (AI) that serve the public interest, such as for healthcare or environmental protection. Although this strategy fails to set out how the French government should promote widespread use of AI throughout the economy, it will nevertheless give a boost to AI in some areas, particularly public services. Furthermore, the plan for promoting the wider reuse of datasets, particularly in areas where the government already calls most of the shots, is a practical idea that other countries should consider as they develop their own comprehensive AI strategies. The French strategy, drafted by mathematician and Member of Parliament Cédric Villani, calls for legislation to mandate repurposing both public and private sector data, including personal data, to enable public-interest uses of AI by government or others, depending on the sensitivity of the data. For example, public health services could use data generated by Internet of Things (IoT) devices to help doctors better treat and diagnose patients. Researchers could use data captured by motorway CCTV to train driverless cars. Energy distributors could manage peaks and troughs in demand using data from smart meters. Repurposed data held by private companies could be made publicly available, shared with other companies, or processed securely by the public sector, depending on the extent to which sharing the data presents privacy risks or undermines competition. The report suggests that the government would not require companies to share data publicly when doing so would impact legitimate business interests, nor would it require that any personal data be made public. Instead, Dr. Villani argues that, if wider data sharing would do unreasonable damage to a company’s commercial interests, it may be appropriate to only give public authorities access to the data. But where the stakes are lower, companies could be required to share the data more widely, to maximize reuse. Villani rightly argues that it is virtually impossible to come up with generalizable rules for how data should be shared that would work across all sectors. Instead, he argues for a sector-specific approach to determining how and when data should be shared. After making the case for state-mandated repurposing of data, the report goes on to highlight four key sectors as priorities: health, transport, the environment, and defense. Since these all have clear implications for the public interest, France can create national laws authorizing extensive repurposing of personal data without violating the General Data Protection Regulation (GDPR) which allows national laws that permit the repurposing of personal data where it serves the public interest. The French strategy is the first clear effort by an EU member state to proactively use this clause in aid of national efforts to bolster AI…. (More)”.